Yesterday was one of those crazy days that was full of highs and lows. In the morning, I talked to my accountant, Eric, who told me my tax bill was going to be about $2,000 more than I was expecting. Womp. Womp. One day I’ll get my business tax estimations right, but this year’s miscalculation on my part was really the result of moving to a new state and not being able to deduct certain things here in Michigan that I was able to deduct in New Jersey. I miss the simpler days of doing my taxes early in my marriage where we each had a W2 and that was about it. Now, with the complexities of running a business and owning a home, I’m glad to outsource this task. I’d be lying if I said I didn’t freak out a little bit, though. I already mentioned a few weeks ago that the hubs and I have been working hard to get our finances on track. We’ve been doing really well with this, but it seems as soon as we get a little bit ahead, there are setbacks. Ah, such is life. I decided yesterday that I could be stressed or frustrated about money or I could do something about it. So, I went down into my basement with the Hubs and I started to look for things to sell. Like many Americans, my basement is full of crap. You would think after moving several times that I wouldn’t have a ton of stuff, but I do. I’m normal. The great news is that lately I’ve been getting huge bursts of energy to purge and sell things like there’s no tomorrow. Seriously, nothing is safe. Hide yo’ kids. Hide yo’ wife. I can’t tell you how GREAT it felt to separate things in the basement, one pile to keep and one pile to sell. down there that I just cannot wait to photograph and put on Craigslist. Our basement has never looked better. I think the Hubs and I went through about 5 huge boxes, and there is more to go. The best part of this massive purge was that Hubs found cold. hard. cash.! I don’t know whether to be embarrassed about this or really excited. I’m just going to go with excited. to budget. We used it when we lived in the Caribbean and we used it when we lived in New Jersey. These days, we use our debit cards for everything and use the free app, Personal Capital, to track our spending. I’m telling you this because the money we found was actually in an old cash envelope marked “Gremlins.” If you don’t know about my weird term, Gremlins, you might want to check out this post that explains it. Basically, Gremlins are the things that pop up in life that you don’t expect, like flat tires or a root canal. Gremlins are inevitable, so I always had a cash envelope for them. If I went a few months without a Gremlin in my life, the cash added up. I honestly couldn’t believe it when when the Hubs started pulling $20 bills out of that envelope! I was jumping up and down like I won the lottery. All in all, there was $231 in there that I totally forgot I had. Awesome, right? I think it’s important to note that this cash will probably go to my babysitter this week. I pay her $300/week to watch the kiddos while I work so that’s a nice chunk of her weekly pay in found money right there. When it comes to found money, it’s really tempting to buy something fun with it or go out to eat to celebrate. This is true whether you find $231 in the basement or inherit $10,000 from your grandfather. However, if you do find some money in the form of an unexpected check or something similar, try to use it towards your money goals. For me, that’s keeping my spending as low as possible so I can save $2,000 in the next month to use for my tax bill! Have you ever found money you weren’t expecting? Have you ever used the envelope system for budgeting before? Loved the story!!! I did the same thing once finding $20 in one of my cash envelopes. Found money is always a nice surprise! Hi Lisa! I know, right!? I wish I could find more lol. Did you know that cleaning your basement is actually spiritual practice? That urge to clear up and unclutter comes from inside of you. 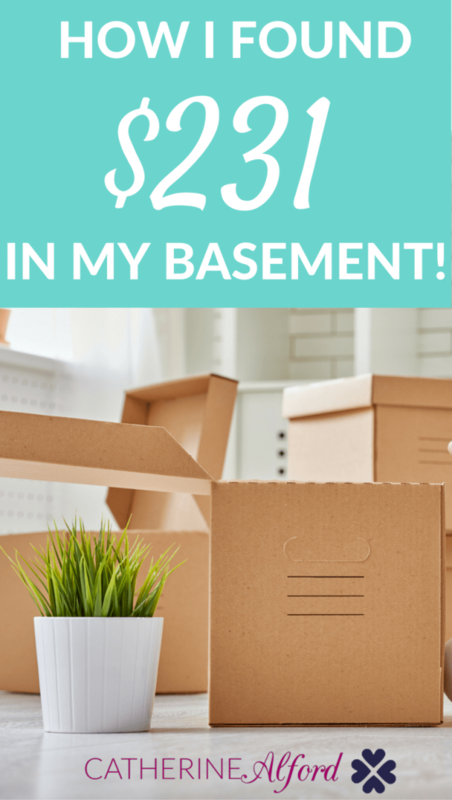 You want your spaces — even your basement — to reflect the kind of clarity and organization you are getting in your mind since you started to reorganize your life and finances earlier this year. And the things you will sell are also “found money” in a way. But the Gremlin envelope is the best! So glad you got that little extra bit of help. excitement seems right choice, at least I am really grateful every time I swap bags, jackets and before laundry I control I still remember time when I found €50 into my bag, really good moment!!! Nice find. It reminds me of one time when my wife and I lost $50 that was a Christmas present. We looked everywhere and figured it was just lost. A couple of years later we were cleaning out boxes from electronic devices, and I looked inside the box from a tablet I’d gotten, and lo and behold, there was the $50. You never know where or when it’s going to turn up! That’s a good amount of money from your basement. I wish I could find more in my basement. I am planning to sell my old and unused item to declutter and to earn some money for paying my tax. This is a good way to do it. Awesome find 😀 Finding a couple hundred bucks beats finding loose change in your pockets any day! Haha well it’s good to get rid of dust too! I hadn’t look at your site for quite a while and it’s completely revamped!!! I’m really happy to see that you’re investing in real estate as compared to putting your money into a 401k or similar. That is a way of ending up with way too little to live on by the time you retire. Hey Adam! Thanks – glad to see you here again! Yep I plan to do a lot more 401k investing in about 3 years but for now, I’m glad we bought a house!